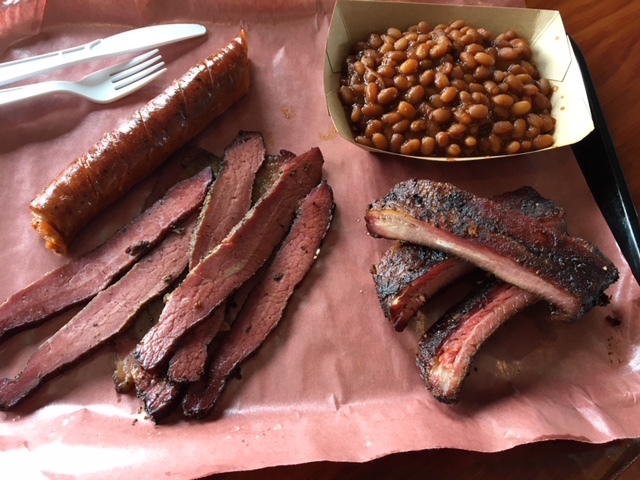 Imagine realizing that perhaps the best bbq joint in the area is nearly right in your own backyard and you've only been there twice in the last year. 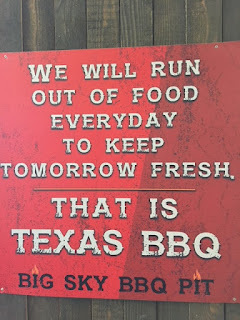 That was the conclusion I came to recently after my second visit to Big Sky BBQ Pit in Okotoks, AB. 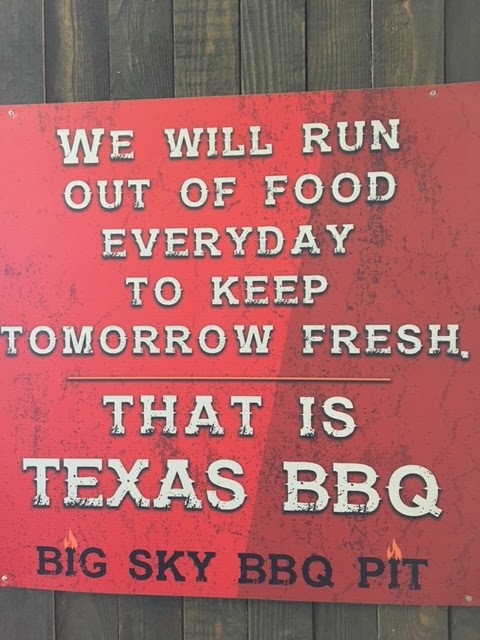 My first visit was just over a year earlier in January 2017 when our family was south of Calgary and we met my boss and his kids at Big Sky for lunch. The big, spacious dining room right away reminded me of a Texas bbq restaurant, as did the communal style tables. A good first impression! There is a counter that you place your order at, and then they call your name when your food is ready. Next to the order counter is a self-serve table with a selection of sauces, including apple and root beer varieties. I ordered a two meat plate with brisket and sausage, while my family opted for pulled pork sandwiches. Our sides were cole slaw, cornbread and the signature smoked beans. The brisket had great flavour and was pull apart tender. The sausage was also excellent with a good spicy kick to it. I had a taste of the pulled pork and it was also very good. The southern slaw was good, but the beans stole the show as far as the sides went. 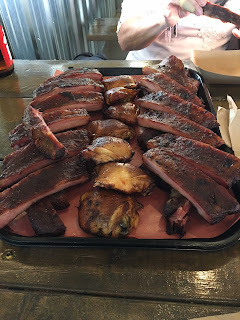 They were cooked in a thick, sweet sauce and complemented by chunks of smoked meats. All of our meals were excellent and my only complaint on this visit was the fact that you paid for your food at the counter when ordering, and then paid a server separately for your drinks. Fast forward a year and I made the trip south again to meet up with a couple of co-workers for lunch on a Sunday afternoon. They were there when I arrived and they had ordered a Fired Up Pig Tail appetizer already. I ordered a beer and the appetizer arrived shortly afterwards. It was a cream cheese stuffed jalapeño wrapped in bacon and a caramel sauce. We cut it into 3 pieces and each had a bite. For our tastes, it was beyond spicy. I enjoy a little heat, but this was too much in my opinion. Our server suggested we may have got one with some of the seeds left in it which would explain the burning in our mouths! I was pleased to see that they had fixed the ordering process that I wasn't a fan of from a year earlier. You now order everything from a server and there is one bill for both food and drink together. We ordered up the Piggy Chick Platter to share between the 3 of us. The platter consists of 4 lbs of ribs, 8 chicken thighs, a tub of beans and cornbread. 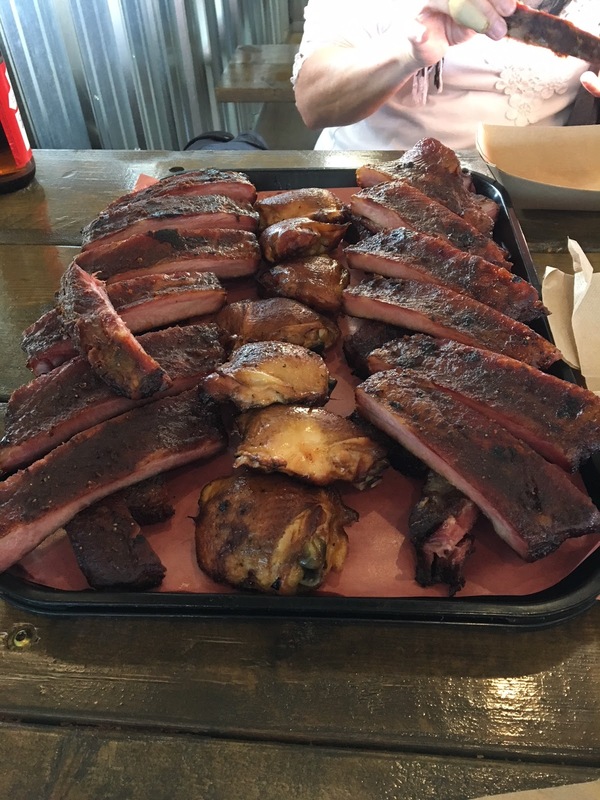 The Piggy Chick Platter...a mountain of smoked meat! Another couple that joined us ordered the Carnivore Platter with pulled pork, chicken, ribs and sausage. It normally also comes with brisket but they were sold out when we were there. They also ordered sides of the scalloped cheddar bacon potatoes and bacon jalapeño mac n' cheese. The ribs were outstanding and cooked perfectly. They serve them dry with just a rub cooked on. I detected a bit of sweetness in the rub, maybe some brown sugar. The meat wasn't fall off the bone, but had a great bit and pulled away with little effort. The smoked chicken thighs were also very good, but were overshadowed by the ribs! The bone-in chicken was juicy and tender and the skin was well seasoned and had a bit of crispness to it. The beans were as good (or better) than I remembered from a year ago and the cornbread was also excellent. It had a smooth, dense texture and great flavour. Everyone at the table appreciated the fact that there were no chunks of corn as you sometimes find. The Piggy Chick platter fed all 3 of us and left enough to take home for 2 or 3 lunches. The friends with the carnivore platter said the pulled pork was good, but they especially enjoyed the sausage. The server said it was a new variety they were making with maple syrup and cheddar. The scalloped were potatoes were a hit, but they found the jalapeño mac n'cheese too spicy. I have been back two more times since that visit in January and I continue to be impressed. Both times I have had the Hungry Man Platter which comes with 3 meats and a side of those excellent baked beans. 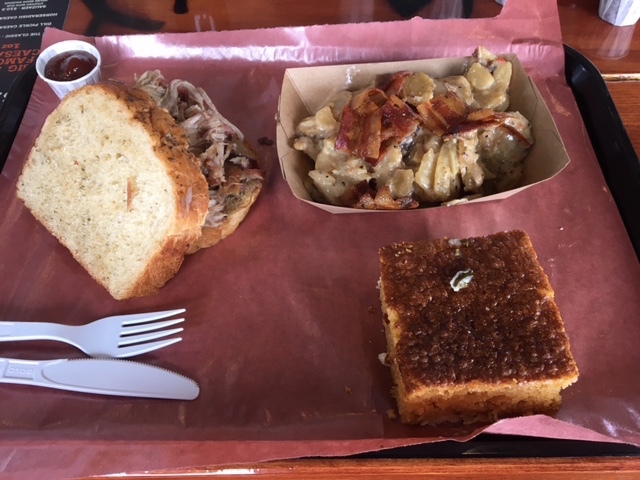 My wife and daughter each went with the pulled pork sandwich with the scalloped potatoes and corn bread. The pork was served on a delicious herb bread. Between my 3 recent visits I've been able to try all of their meats with the exception of the beef ribs. Everything has been excellent, but I did find the brisket a little dry on one of my trips, but that will happen. The maple & cheddar sausage is some of the best I've had anywhere and the pulled pork has great flavour to it, I particularly liked it with a touch of the root beer sauce. Big Sky boasts a huge outdoor patio and they host a number of special and community events. One of the things I love most about barbecue is the sense of family and community. These guys seem to get that and embrace it. I strongly encourage you to make the short drive from Calgary out to Okotoks to try it for yourself. I'm certain you won't be disappointed!